We have various NPK fertilizers in mixed form of powder/crystalline and miniprill/granule. The WOPROFERT® NPK watersoluble fertilizer is produced from premium-quality raw materials, without residues. 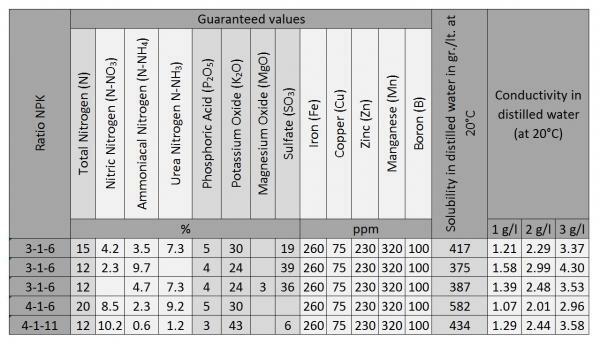 Why use WOPROFERT® NPK fertilizer? EDTA-chelated trace-elements, other than boron, preventing leaching and guaranteeing perfect absorption. WOPROFERT® NPK fertilizer in water-soluble form, can be used in all types of fertigation systems (drip/b/drip, micro-jet, sprinkler and channel). For fertigations systems: 1 to 3 g/lt. of irrigation water. For foliar treatment: a 0.5% solution, either 1 kg per 200 lt. or 5 kg per 1000 lt. The recommendations above should be adapted according to differences in climate, soil, temperature, varieties, yields and irrigation systems. 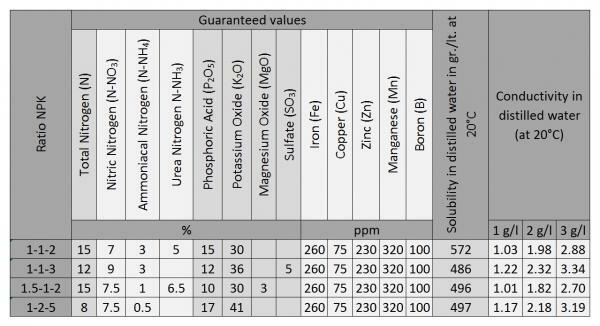 In addition, the numbers of applications and the quantity per ha, as well as the interval times may vary depending on the formulations. We can offer you several standard formulations of NPK fertilizers (as mentioned below). Furthermore, tailor made formulas are possible as well (min- 10 mt net). It can be packed in standard neutral or simple labeled WPP/PE-bags of 25 kg net, or in a pre-printed PE or WPP/PE laminated- bag, min. quantity of 10,000 bags. This is a family of products with a high Nitrogen content and NPK ratios of 2-1-1 of 3-1-1. WOPROFERT® High Nitrogen improves the vegetative development of fast growing plants and is recommended in situations where plants show a lack of vigor. It is recommended to apply it from the beginning of the vegetative growth until the end of the flowering period. It is well adapted to sandy soils and crops lacking in organic material. 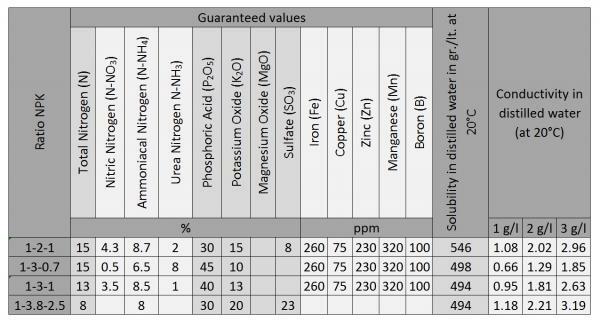 The three Nitrogen sources ensure progressive availability and avoid leaching. Phosphorus derives from the M.A.P. and Potassium from Potassium Nitrate and/or Potassium Sulphate. Legal tolerances as per EC-regulations. This is a family of products with a high phosphorus content and NPK ratios of 1-2-1, 1-3-0.7, 1-3-2 or 1-3.8-2.5. 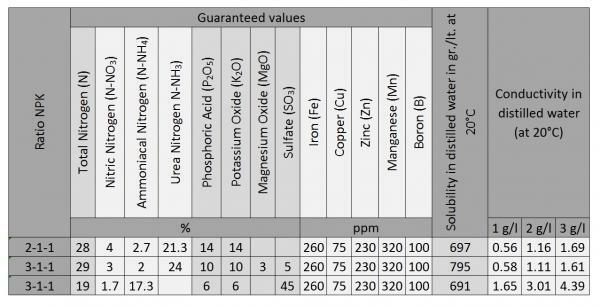 It is well suited to soils poor of/or lacking phosphorus. On well-balanced soil, it is generally used just after planting out or seeding. It is also recommended to be used just before the flowering of crops with a high clearance (i.e. tomatoes). WOPROFERT® High Phosphorus improves the rooting phase, the flowering induction and the fruit production at the end of the vegetative phase. Crops requiring Phosphorus are potato, onion, strawberry, Brussels sprouts, spinach, tomato and flowers. This is a family of products with a high Potassium content and NPK ratios of 1-1-2, 1-1-3, 1.5-1-3 of 1-2-5. Well adapted to soils lacking in Potassium. WOPROFERT® High Potassium improves the fruit and vegetable ripening phase, from the end of development until harvest. The Potassium increases resistance against temperature stress. It is a key element for sugar and starch synthesis, and so contributes to the quality of the harvest product. Therefore it is particularly recommended for crops that require potassium (potato, onion, cauliflower, tomato, begonia, etc.). This is a family of products with an NPK ratio of 1-1-1. Suited for well-balanced soils. Requirements of plants in the vegetative phase and/or fruit development will be met and will therefore guarantee you the best results. This is a family of products with a low Phosphorus content and NPK ratios of 3-1-6, 4-1-6 or 4-1-11. Well suited to soils with a high Phosphorus content, during the phase of vegetative growth. For well-balanced soils, apply it after flowering or at the beginning of the fruit development. It improves fruit/vegetable ripening. A supplement of magnesium is recommended at this stage. Copyright 2016 - Simonis Fertilizers B.V.